HEIST! Get there these holidays! 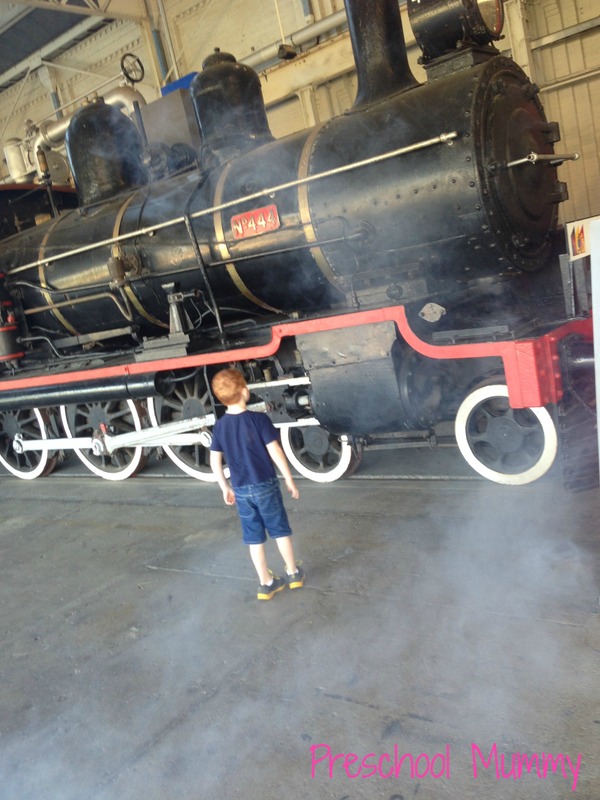 If you’ve been following from the start, you’ll know that my little family are regular patrons of The Workshops Rail Museum at Ipswich. I wrote my very first outing review for The Workshops Day Out With Thomas exhibition. Check it out here. 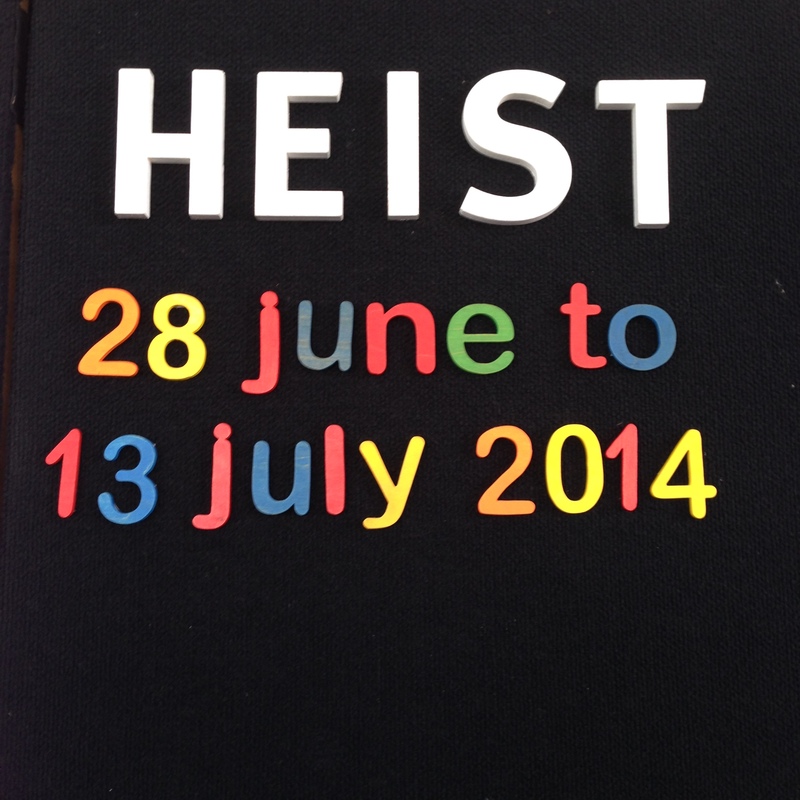 The midyear school holidays have arrived and so has HEIST, The Workshops newest display just for kids! 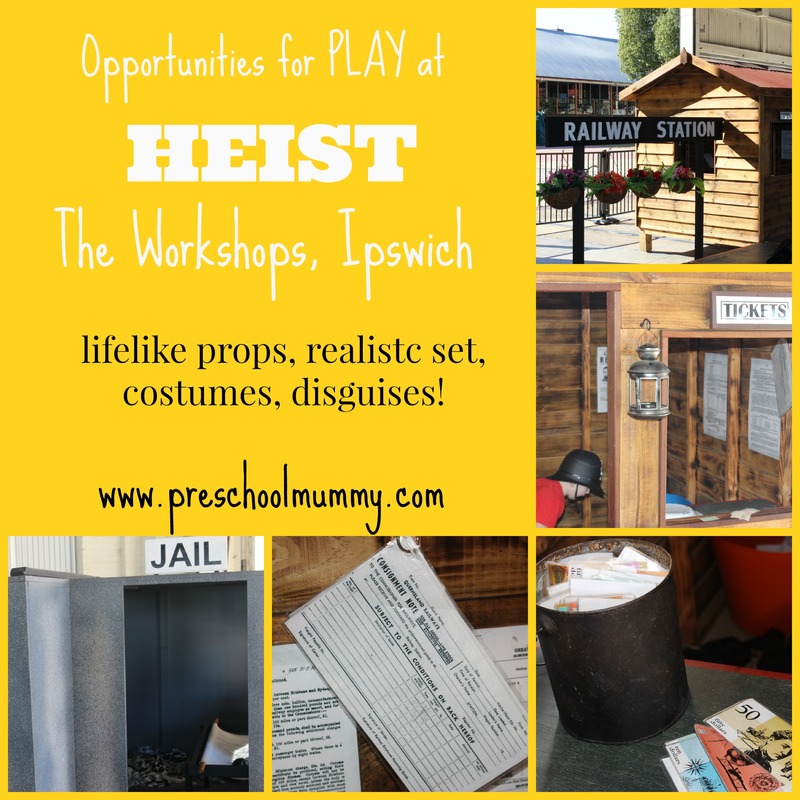 We headed out to HEIST courtesy of the awesome staff at The Workshops, last Thursday. This beautiful mild winter the South East is experiencing is perfectly conducive to a day out in Ipswich, and it’s just a short drive from Brisbane. Glorious, to say the very least! We had packed a picnic lunch and arrived in time to enjoy it under the white marquee tents drenched in sunshine (and a lovely coffee from the café there for Mummy and Daddy). Then we headed in to the museum for the HEIST performance at 2pm. My children delighted in the slapstick physical comedy routine by the solo performer. He told the story of a rogue bushranger Brian being pursued by antagonist The Sarge. 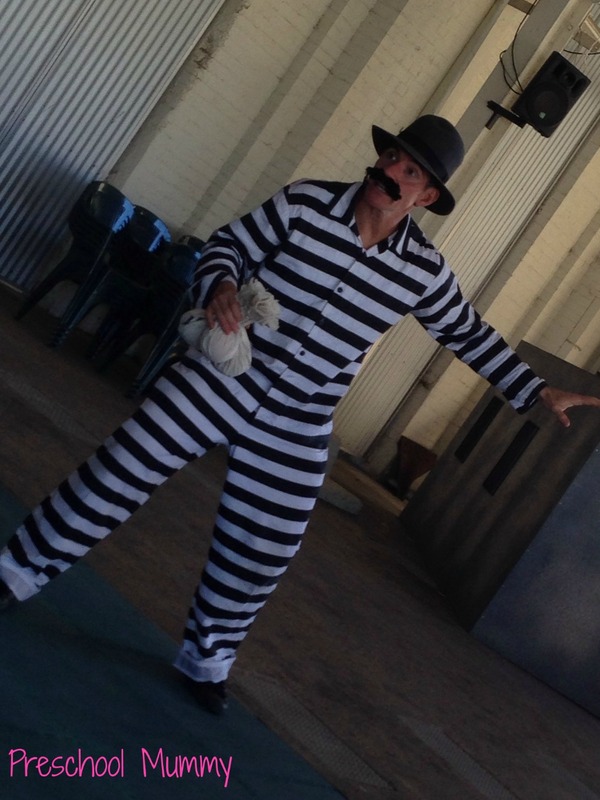 The audience was wowed by the bushranger’s balancing skills, interactive tale and dinky-di Aussie bush accent as he took us on a narrative journey. But mostly, my preschoolers enjoyed the bum jokes. As you do. Bushranger Brian spinning a yarn to his captive audience. Adjacent to the performance stage there’s a totally awesome dramatic play set, featuring a jail, a quaint train station, and a locomotive. And heaps and heaps of costumes. One of my boys chose to don a robber costume, the other one a policeman’s hat (what a cute little Bobby he made! ), and they ran around like crazy snatching the “loot” from one another, climbing through the train, pelting through the station until finally the little one locked the big one in the jail and slammed the door shut. All the while, Preschool Daddy and I sat by watching their imaginative play taking place. We agreed on how fantastic the set-up was, and how well considered by the staff who planned the exhibition. Incorporating a space where children can play is wonderful, as it gives them ownership of their learning and provides an opportunity to use their newly acquired vocabulary and knowledge gained from the show. You can read a little more about why play is so important for young children here. So many great play-based resources to inspire meaningful play through learning. Being a very hands-on toddler, my littlest man, Bean, 2, swiftly shifted his attention to the sandpit section where he was encouraged to dig for loot. 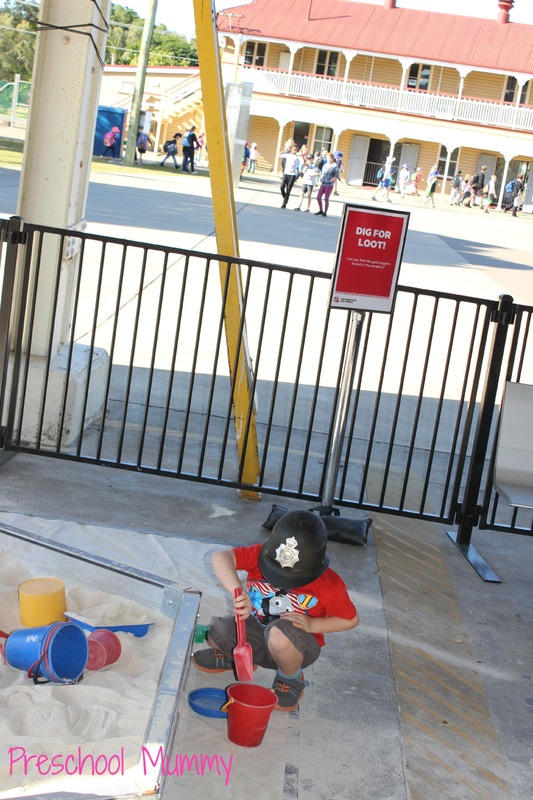 This was a great activity for his age group and while Bug, 4, continued to play cops and robbers with some newly acquired friends, Bug enjoyed digging and hiding treasures for twenty or so minutes. What can beat a sand pit? What can beat a sand pit, you ask? Why, a little train ride, of course! I popped in to the gift shop to buy some tickets and we queued for the last train ride of the day (the train finishes running at 3pm). As we twisted and turned through the museum’s outside grounds, I admired the brickwork and architecture, and the children waved to the other visitors who were exploring on foot. As Bean was checking out this beautiful old girl, steam appeared everywhere and he was thrilled! Once inside the museum building we explored the Creation Station, where the boys made robber masks (and could also choose to make composite pictures for a Wanted sign). There’s a reading nook which is filled with picture books about trains, where little man sat to chill for a while. So cool to have a dedicated literacy area! We then headed to Nippers, where the boys could do some more PLAY! Yay for play! One thing that keeps us coming back to The Workshops is that it’s so well set up for young children to enjoy their day; there’s just so much to keep them entertained and extend their knowledge of all things rail, whilst having fun. We then decided to have a look inside a model tilt train and the boys had a turn in the drivers seats. Daddy stayed with them while I took baby Rosie and we explored the beautiful old dining carriage of a vintage locomotive. Being obsessed with all things of old, I loved viewing the relics that have been cared for by the museum. We guaranteed him on the way home, that we’d return very soon. We’re super duper excited about the next school holiday event, Bright Sparks, which is a science/investigations based exhibit, running from 20 September – 6 October 2014. Can’t wait. Check out The Workshops Website for information on all upcoming events and prices! We’re also got our eye on a Steam Train Ride this winter! The train interest obsession is going from strength to strength in this little family! 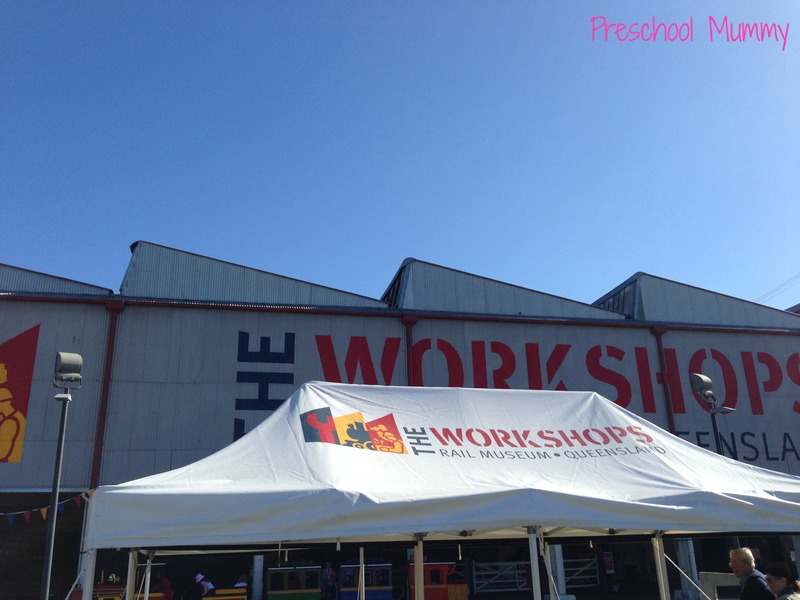 Have you been out to The Workshops? What’s your favourite type of train? Linking up for IBOT on Essentially Jess. Next Post In space no one can hear you scream. But four other people live in our house, so stop screaming. Indeed! Would be so fun to go along with some little grandchildren too! 🙂 thanks for visiting! Bek I’m thrilled you visited my blog, thanks! Definitely one to get to! Also Queens Park in Ipswich is a lot of fun! We have just arrived home after using our free family pass that we won through Preschool Mummy. We had an awesome day! The kids loved the show, the Nippers area and going for a ride on the train. We will be back! Thanks again for a fantastic prize! Hi Amanda! Thanks for popping in to update us! Congratulations, so glad you enjoyed your day as much as we did! Fantastic!